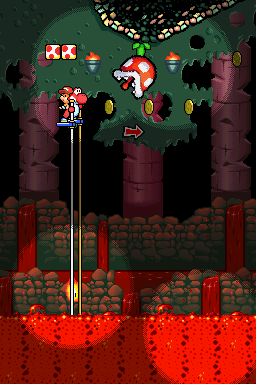 Yoshi on Stilts is seventh level in World 2 in the game Yoshi's Island DS. This level is where Yoshi first uses the Stilts. Its name is likely a callback to Shy-Guys On Stilts from Super Mario World 2: Yoshi's Island. This level starts in a jungle area with water at the bottom. Yoshi can take a top or bottom path, the top needing Baby DK to access. The top route has a hidden tunnel to a door to a bonus area with a Character Coin. The bottom route has a tunnel with Nipper Plants. The top route drops into the bottom route. Then, Yoshi continues into a tunnel with more Nipper Plants and Shy Guys on Stilts. The middle of this area has a checkpoint ring. Yoshi enters a pipe at the end of the area and enter an area with lava and torches. Yoshi needs to hop on the stilts to cross. He enters another pipe at the end of the area into another short jungle area. Yoshi has to jump over some small ponds to reach the goal roulette. German Feuriger Stelzenlauf "Fiery Stiltwalking"